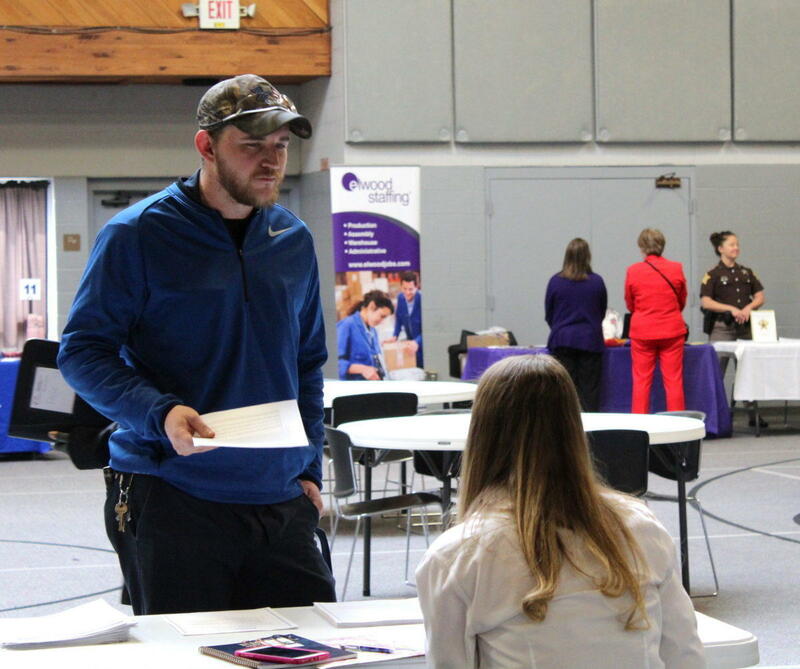 “It’s one of the best jobs you can find around there,” Carwile said. Just a few years ago Century was laying workers off, not hiring them on. Century idled 60 percent of its capacity in 2015 and laid off more than 300 workers here. 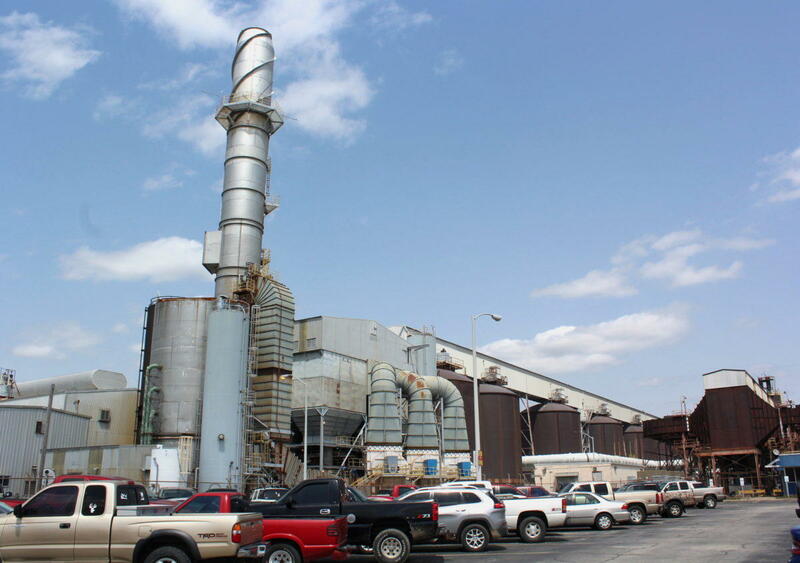 Now that the Trump administration is placing tariffs on steel and aluminum imports, Century plans to bring the Hawesville smelter back to full capacity, invest $150 million, and create up to 300 new jobs. Carwile was excited to hear about the new jobs but he’s a little concerned about how long those new jobs will last. 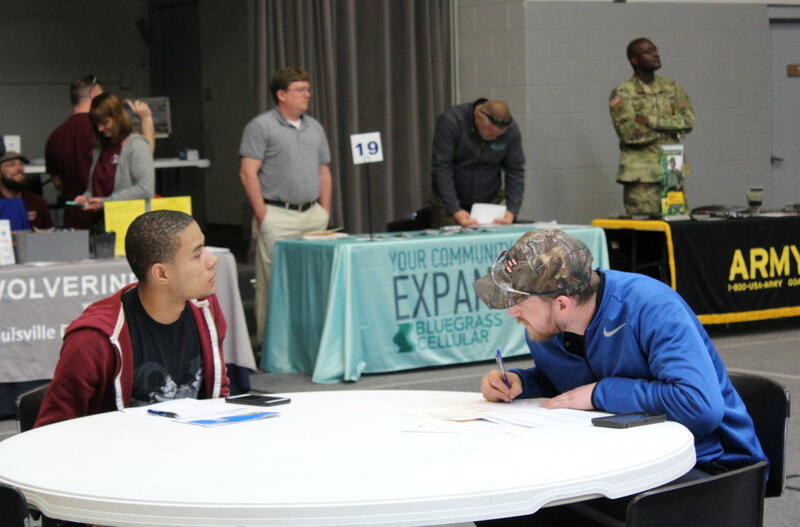 John Agrinzoni, left, and Brady Carwile, right, at a job fair. “I’m worried about the tariffs being repealed or something like that and then seeing, ‘Oh well that money’s not coming in now.’ What’s going to happen then? That’s what I’m more worried about,” he said. 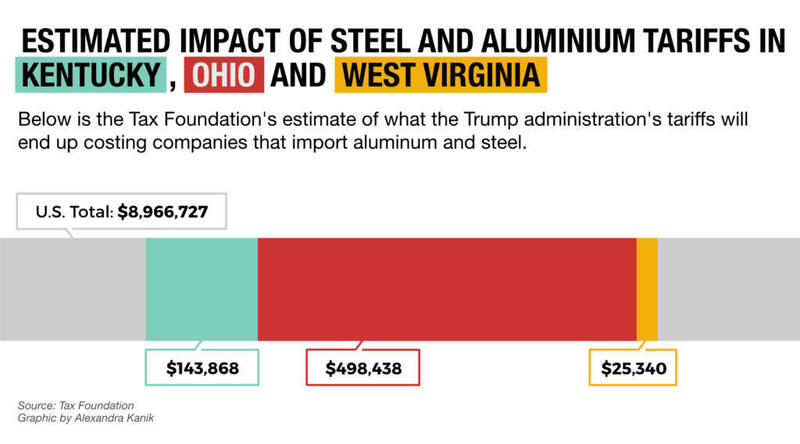 With more than 220 steel and aluminum facilities in Kentucky, Ohio and West Virginia, the Ohio Valley has a lot riding on the Trump administration’s taxes on imported metals. While the industry was cheered by Trump’s initial announcement on tariffs, actions since then have raised some uncertainty about just how big a boost domestic metals makers can expect. In March, when Trump first announced tariffs of 25 percent on imports of steel and 10 percent on aluminum, Century’s Hawesville workers like Dusty Stevens were in the White House to show support. 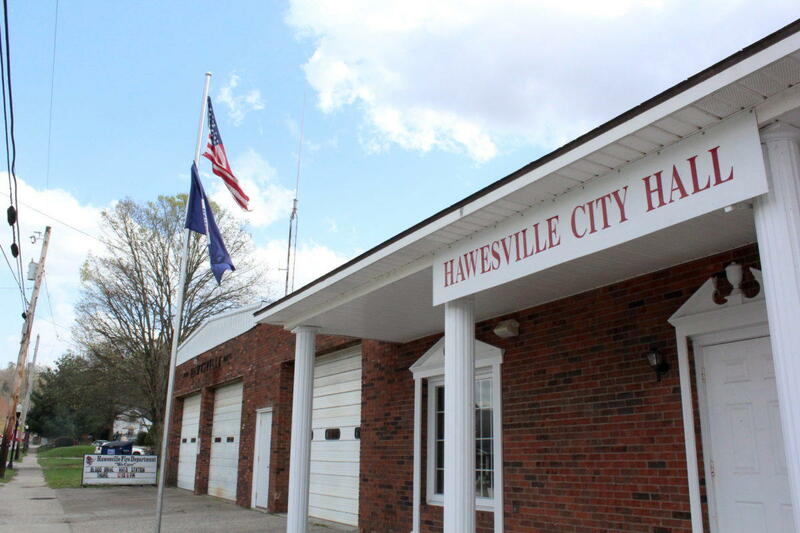 “My father worked in the industry and worked at that plant for 40 years, so this hits home for all of us at Hawesville,” Stevens said. Century Aluminum in Hawesville, Ky. But in the following weeks Trump gave temporary tariff exemptions to some of the largest metals suppliers, including the European Union, Mexico and Canada. This month the Trump administration delayed a decision on permanent exemptions to those countries. The White House said all countries that are exempted from the tariffs will face quotas or other restrictions, such as those recently placed on South Korea’s steel exports to the U.S.
Century Aluminum Executive Vice President Jesse Gary said Century had not planned new investment in the Hawesville smelter until the tariffs were announced. And he said strong tariffs or quotas are important for his business to rebound from the effects of what he calls unfair foreign competition. Gary said Century is making its investments based on a belief that the tariffs will be in place for the long term. “So I think the intent of the administration is they will remain in place until the U.S. industry is back on its feet and ready to meet the country’s national security needs,” he said. 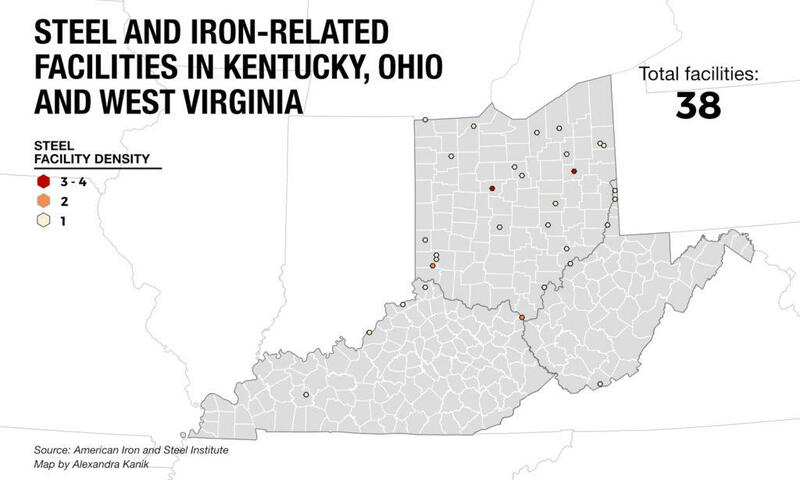 Roger Newport is CEO of AK Steel Corp., which has locations in Kentucky, Ohio and West Virginia. At a recent press briefing Newport said he supports the tariffs and quotas but is disappointed by the president’s delay. He said the administration needs to make sure that the delay does not allow countries to dump unfairly priced products in the U.S. ahead of the tariffs. “We’d like to see it get done sooner than later but we appreciate the actions that have been taken to move everything forward,” Newport said. 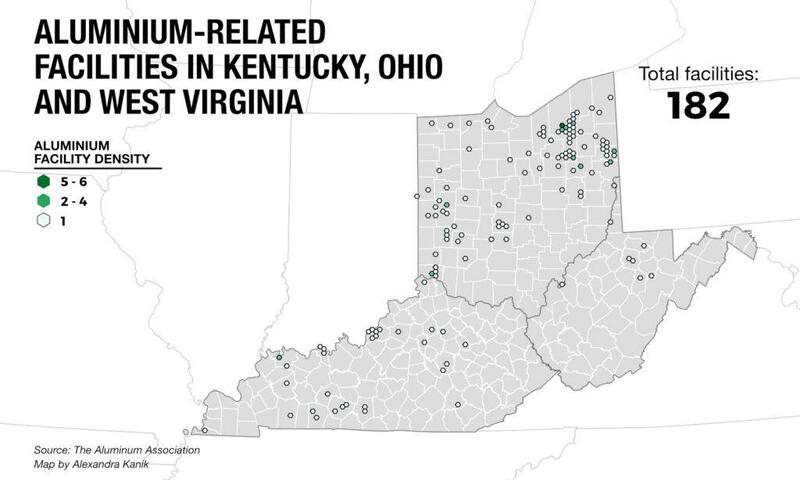 According to industry trade groups, steel- and aluminum-related facilities in Kentucky, Ohio and West Virginia still provide more than 44,000 jobs despite sharp declines over the years due to foreign competition. 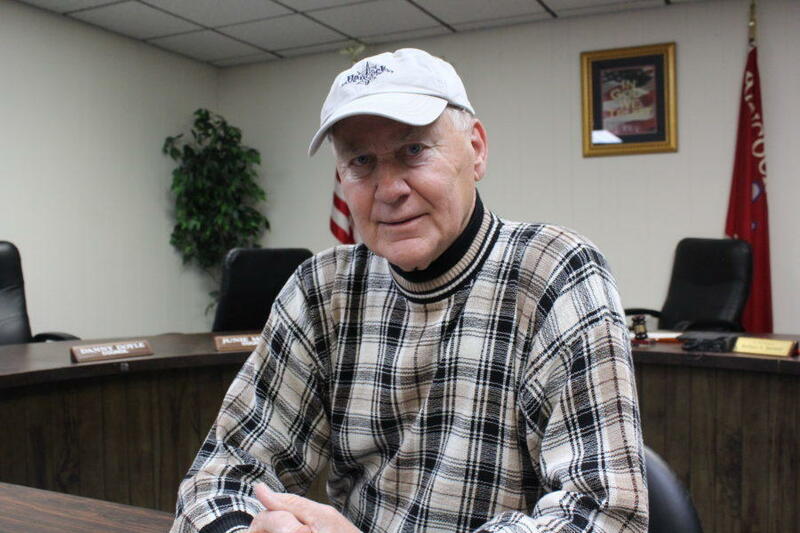 Dave Martin is president of United Steelworkers Local 5668 in Ravenswood, West Virginia, where Century Aluminum used to have a smelter before it was idled in 2009. Martin now works in fabrication at Constellium in Ravenswood. The Netherlands-based company has locations in West Virginia and Kentucky making parts for the aerospace and auto industries. Martin said Constellium imports some aluminum for fabrication. That could mean the tariffs would hurt the company by raising material prices, one of the many risks economists warn about regarding tariffs. But Martin said he thinks having Century increase domestic capacity nearby could help. Martin said a lot of jobs have been lost because of foreign competition and he hopes the tariffs will bring some of those jobs back. “And y’know, I’d just like to get back home,” he said. The Trump administration is expected to make a decision on which countries keep permanent tariff exemptions in June.